The circulatory system, also known as the cardiovascular system, consists of the organs and fluids that transport materials across the body. Vertebrates have a closed circulatory system, which means that blood remains within blood vessels and does not directly interact with body tissues. In birds and mammals, the primary organ of the cardiovascular system is a four-chambered heart, with its associated blood vessels. In other vertebrates, the heart can have either two or three chambers. Many invertebrates have an open circulatory system, where blood (also known as hemolymph) bathes the cells and organs directly. Animal evolution has resulted in an increasing degree of specialization within tissues and organs. For instance, simple multicellular organisms like sponges have structures where every cell interacts directly with the environment. Each cell exchanges materials, obtains nutrients, and expels its waste into the extracellular region. In larger, more complex animals, however, this is difficult since there are many cells present deep inside the organism that interact minimally with the external environment. Therefore, each of the basic functions of an organism has to be accomplished by a specialized set of organs. For example, the digestive system is specialized for efficiently extracting useful nutrients from food. Similarly, the respiratory system deals with the exchange of gases, while the nervous and endocrine systems are involved in coordination and homeostasis. However, in order to sustain each of these organ systems, the body needs a circulatory system that allows every cell, whether present on the surface of the organism or embedded deep within, to derive sustenance, be protected from pathogens, to communicate with other cells and to exist in a relatively constant microenvironment. For instance, the intricate network of blood vessels that surrounds the small intestine absorbs the end products of digestion. The pituitary gland situated deep within the brain releases hormones that influence the musculoskeletal, integumentary, and reproductive systems. These hormones are carried to their target organs and cells through the circulatory system. At alveoli, oxygen from air diffuses into capillaries where it binds to hemoglobin in red blood cells. Through this carrier protein, blood delivers oxygen to every cell within the body. Blood also plays an important role in maintaining the pH of the body. This is particularly important as pH influences the efficiency and effectiveness of every biomolecule. Temperature regulation is also carried out by the circulatory system. When the body temperature rises, there is vasodilation in the skin, leading to heat loss. In cold temperatures, blood vessels supplying blood to the extremities constrict, preserving body heat for critical internal organs. Finally, the blood and lymph contain antibodies and immune cells – important mediators of protection from infection. This includes the cells of innate immunity present from birth as well as the adaptive immunity acquired through exposure to pathogens. The circulatory system consists of the heart, blood, blood vessels, lymph, and lymphatic vessels. 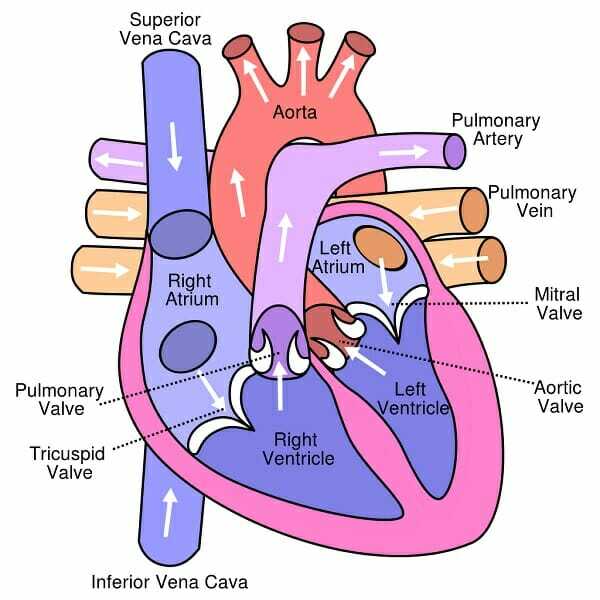 In humans, the heart is a four-chambered organ, containing two atria and two ventricles. The atria are the receiving chambers and receive blood from veins. On the other hand, ventricles are designed to be efficient pumps, sending blood into arteries. Oxygenated blood from the lungs arrives through the pulmonary vein to the left atrium. It passes into the left ventricle through the mitral valve during atrial systole or contraction. During ventricular systole, this blood is pumped into the aorta to be circulated in the body through arteries, arterioles, and capillaries. Exchange of materials occurs through the single-celled endothelial walls of capillaries. Deoxygenated blood from various tissues then returns to the right atrium of the heart through two major veins – the superior and inferior vena cava. Once deoxygenated blood reaches the right ventricle through the tricuspid valve, it is pumped to the lungs during ventricular systole through the pulmonary artery. In the lungs, gas exchange at alveoli. The image above shows the four chambers of the heart along with major blood vessels and valves. The circulatory system in humans can, therefore, be divided into two loops that center around the heart. The first is called pulmonary circulation and it carries blood between the heart and the lungs. The other extensive loop is called systemic circulation and begins from the aorta and supplies oxygen and nutrients to all the tissues of the body, including the muscles of the heart itself. There are two major types of blood vessels – those that bring blood towards the heart are called veins and those that carry blood from the heart towards other tissues and organs are called arteries. Arteries and veins undergo repeated branching to produce arterioles and venules. The thinnest blood vessels are capillaries, made of a single layer of squamous epithelial cells. 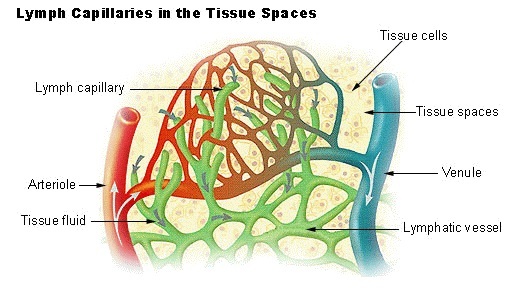 These thin tubular structures are the primary site for the exchange of materials between the circulatory system and tissues. 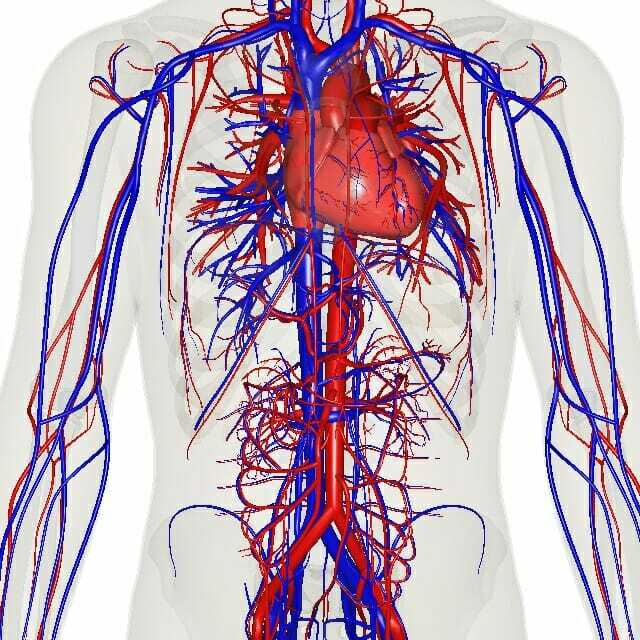 The image above shows the network of blood vessels through the body, with the arteries represented in red and the veins in blue. 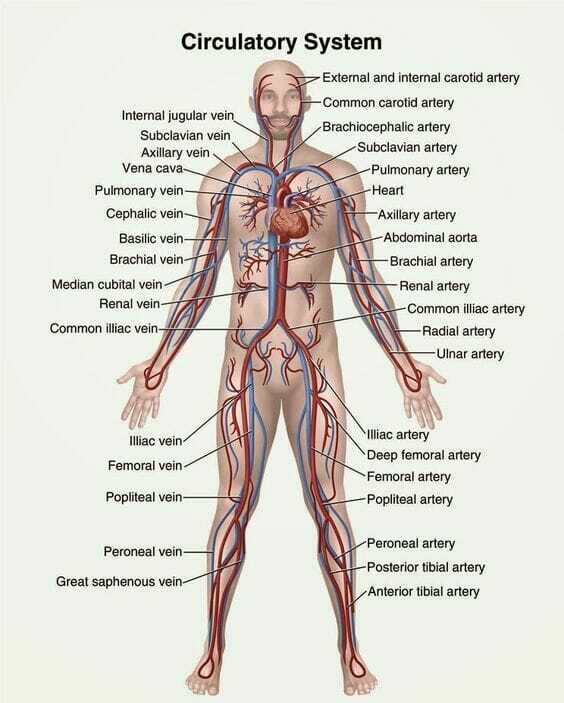 This is the case with real blood, as arterial blood is usually bright red in color because of the large amount of oxygen it carries, while venous blood is darker and more blue/purple. The blood drawn for routine tests is often from the veins. Arteries of the systemic circulation contain oxygenated blood, while the veins bring deoxygenated blood containing high amounts of carbon dioxide towards the heart. The reverse is true for pulmonary circulation since the blood receives oxygen in the lungs, then makes its way back to the heart to be pumped out to the body. Interstitial fluid is a colorless solution that bathes all the cells of the body and forms a major component of the extracellular fluid. It is formed due to the hydrostatic force of blood in capillaries, leading to the egress of water, ions and small solutes from the circulatory system. Thus, interstitial fluid is similar to blood plasma in many ways. Some of this fluid starts to flow into the extended open-ended network of tubular structures forming the lymphatic circulation. This fluid is now called lymph and passes through lymph nodes, where pathogens, damaged cells, or cancerous cells can be trapped and destroyed. Metabolic wastes and cell remnants are then moved towards the bloodstream and processed before being expelled or excreted as body waste. Image shows the arteriole in red, venule in blue, and the flow of blood through capillaries. The open network of lymphatic vessels is represented in green with arrows indicating the entry of tissue fluid into lymphatic circulation. One of the important functions of the lymphatic system is to maintain fluid homeostasis between the liquid in blood and the fluid content of tissue fluid. A properly functioning network of lymph vessels and nodes prevents edema, contributes to immunity and is crucial for the absorption of fats and fat-soluble vitamins. As a whole, the circulatory system has a general pattern, structure, and flow. Blood starts in the heart, where it is split into two patterns of circulation. The pulmonary circulation goes to the lungs and back to the heart. This circuit is used to oxygenate the lungs. Then, the blood reenters the heart and is pumped through the systemic circulation. These veins and arteries serve the body and have a standardized setup. First, arteries carry oxygenated blood toward the tissues. As the arteries get closer to their target tissue they get smaller and smaller, eventually leading to capillaries. Capillaries are the smallest of all vessels, and they serve as the site of gas exchange in the tissues. On the other side of capillaries, the veins start. Veins carry deoxygenated blood, along with various waste products, back towards the heart. The waste products will be excreted in the lungs, or they are filtered out by the liver or kidneys. In other animals, the circulatory system can vary widely. This article describes the closed circulatory system of humans and other mammals. Fish, on the other hand, have only a 2-chambered heart and the entire circulatory system is much simpler. Other organisms, such as insects and other invertebrates, may have an open circulatory system. This form of circulatory system simply bathes the organs and tissues in a blood-like fluid but does not contain veins or arteries. Still other animals, like the octopus, have multiple hearts to accomplish the tasks of the circulatory system. The circulatory system is a vast network of tubes and acts like the lifeline of the body, transporting a number of substances from every cell and tissue towards their ultimate destination – whether it is toxic substances that need to be metabolized in the liver, hormones that need to be delivered to target organs or nutrients and oxygen required by every cell. However, the extensive nature of the circulatory system, with tubular structures of varying diameters and histology, makes it vulnerable to some kinds of diseases. Among these, the formation of fatty plaques in blood vessels, and clotting disorders that inhibit the body’s response to injury are particularly harmful. Arteriosclerosis is a general term for the hardening and stiffening of arteries and arterioles. It results in an impairment of the circulatory system to supply crucial nutrients to different parts of the body since arteries must remain elastic to accommodate blood pressure. If the walls of an artery or arteriole become stiff, they can no longer adapt to the fluid pressure generated by every heartbeat, which results in an extra strain on the heart muscles. Among the variety of causes for arteriosclerosis, the formation of a fatty plaque that occludes the blood vessel is called atherosclerosis. It begins with an injury to the inner endothelial wall of the artery or arteriole, from pollutants, or through the presence of a large amount of low-density lipoprotein (LDL) and cholesterol. This hampers the barrier function of the endothelium and allows cholesterol and other LDLs to move towards the inner tissues of the arterial wall. The presence of these molecules in the damaged area activates the immune system, recruiting macrophages to the site of injury. When there is a large amount of LDL in the plaque, macrophages are unable to clear the site and undergo necrosis, forming a core of dead cells within the arterial wall. This is followed by the calcification of the plaque as well as the formation of a fibrous cap around the entire structure. These events increase resistance to blood flow and reduce the diameter and elasticity of the blood vessel. Over time, these plaques could get partially disconnected from the artery wall, exposing the inner necrotic cells to blood, and result in blood clotting. They could also get dislodged completely and move towards smaller blood vessels and occlude them completely. Atherosclerosis can lead to a number of illnesses based on the blood vessel affected. If the arteries supplying blood to the heart are affected, it can lead to angina (pain in the chest), cardiac infarction or cardiac arrest. Atherosclerosis can result in an increase in blood pressure when the arteries of the kidney are partially or completely blocked. Complete blockage of any blood vessel supplying critical oxygen and glucose to the brain results in a stroke, with possible irremediable damage to neurons and nerve tissue. If blood vessels supplying oxygenated blood to the limbs or extremities are affected, it can lead to necrosis of tissues and potentially result in gangrene. 1. Which of these statements is true? 2. Why would workers in a shipyard exposed to asbestos be at a higher risk for coronary artery disease? 3. Which of these terms specifically refers to the hardening of arteries through the formation of plaques? 4. A fish heart has only two chambers: a single atrium and a single ventricle. Which of the following is a reason fish do not need a 4-chambered heart? A. There is no reason, just random luck. B. Gravity makes it harder for terrestrial animals to pump blood, so they must separate chambers. C. Gills are more efficient than lungs at receiving oxygen. 5. The lymphatic system is an important part of the circulatory system. What are the major functions of the lymphatic system? A. To move extracellular fluid around cells. B. To provide immune cells with access to various tissues for defense. C. To help regulate blood pressure and the body's fluid content.